It is also my alma mater. Billy Adams, a former Colorado legislator who later became the Governor of Colorado, worked for three decades before getting the authorization to found Adams State Normal School in 1921. His goal was to educate teachers for the remote, rural areas, such as the San Luis Valley. The college hired Dr. Ira Richardson as the college’s first president in 1925, which Richardson Hall is named after. Dr. Fred Plachy was president of ASC in 1952. Dr. Plachy had great foresight anticipating growth to the campus of Adams State. His foresight was correct as the enrollment grew from 349 students in 1950 to 2,000 students in 1965. During this time, a ten-year building program began in which the majority of the current campus facilities were built. Adams State College has seen a vast amount of growth in enrollment and building during the past several years. 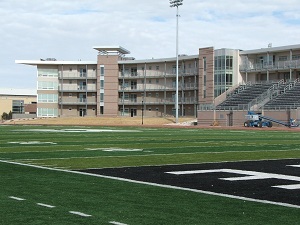 The campus now has a beautiful new football field with artificial turf, and they added new dormitories which have balconies overlooking the football field. These are available to students with high academic achievements. Adams State renovated the basketball, indoor pool, and indoor track facility, known as Plachy Hall. 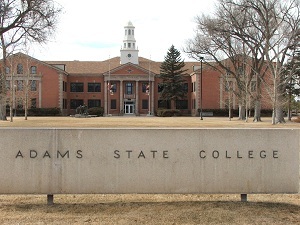 Adams State College has grown into an excellent liberal arts college with 16 bachelor’s degrees and 28 minors and emphases. It is a very close-knit campus with most classes having no more than 20 students per professor. This allows for one-on-one learning and for the teacher to know each student by name. 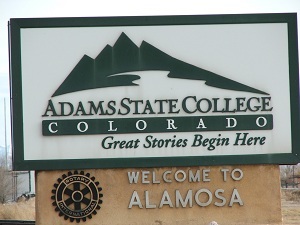 Adams State College is a NCAA Division II school and a member of the Rocky Mountain Athletic Conference. It has a large range of varsity and junior varsity sports for men and women such as football, basketball, track and field, swimming, etc. The college also has intramural sports which allow students to participate in competitive sports in a more relaxed atmosphere. There are many different sports throughout the year and students are encouraged to participate in several of them. Adams State College is really home to my family. My aunt graduated in 1965, my brother in 1978, and I graduated in 1980. I worked two years as the Assistant Financial Aid Director for ASC before marrying in 1982. I am proud to be an alumnus of Adams State College. I know that it is a wonderful institute with small classes which makes it easy to get to know the professors on a personal basis and make life-time friends. When in Alamosa, I encourage you to look over the campus and check out a sporting event. Winter, 1925-26—Adams State’s first men’s basketball team which had eight male students and they competed against area high school teams. Fall, 1926—Adams State enrolls 132 students and the colors of green and white were adopted. 1930—The name was changed to Adams State Teachers College and the ASC’s first football team was formed. 1943-44—enrollment dropped due to World War II with only four degrees granted. 1973—present library complete with a human chain transferring 140,000 books hand-to-hand over a half-mile between buildings. 1980—Year of my graduation with a Bachelor of Science in Business Administration; minors in Psychology and Sociology; and a Secondary Teaching degree—YEAH. 1992—the men’s Cross Country team wins the National Championship in the first year of NCAA Division II competition. 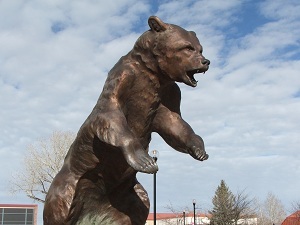 1995—The Indian mascot was retired replaced with the Grizzly. 2005—ASC introduces new majors in Anthropology, Physical Geography, Sports Psychology, and a new emphasis in Creative Writing.